Plantain stem poriyal is an easy to make, healthy stir fry that can be served as an accompaniment to rice. It is an excellent source of fibre and pottasium; also helps in overall functioning of the digestive system. Try this recipe and include in your meal for a healthy living! Soak moong dhal in water for about for 20 to 30 minutes and keep aside. Remove the outer layer of the banana stem. Cut into roundels, removing the thread like fibre and discard them. Chop that into small pieces. To prevent darkening, put them in a diluted mixture of water and buttermilk. Once it crackles, add chopped onion and fry till onion becomes translucent (strain the water from both moong dhal and plantain stem before cooking). Now add the chopped plantain stem, soaked moong dhal, salt and water (just to immerse the plantain). Give it a mix. Close a pan with lid and cook till the it becomes soft and water dries up. 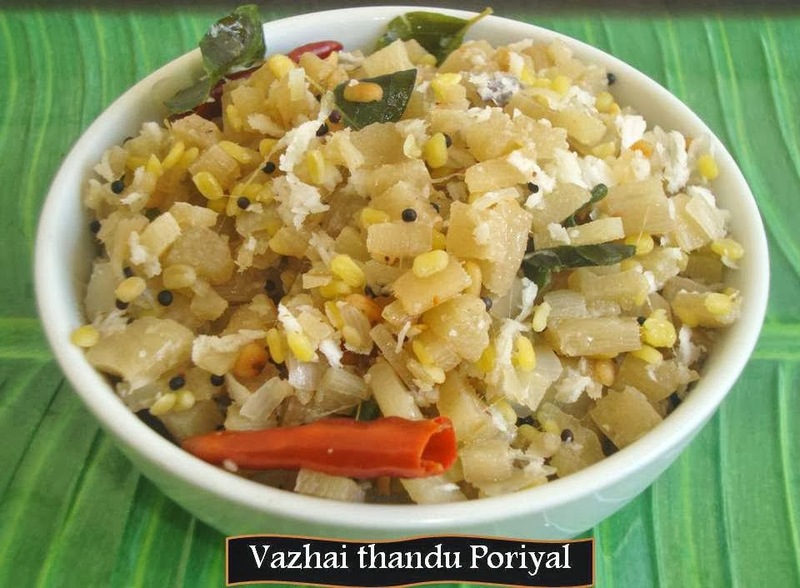 Sprinkle grated coconut and give it a thorough mix; Plantain stem poriyal is now ready to serve! You can also substitute green chillies for red chillies. Very healthy... I used have it at my moms place... not able to find thandu here in pune, have to search. Never had plantain stem. Probably had it with south indian thalis wondering what it was. I have had the flower aka valaippoo before. My mom makes koftas like the mutton kofta recipe on my blog. Fiber rich side dish for rice, a healthy recipe! Fiber rich poriyal, love simply with some rice. Healthy yummy Poriyal.. I am missing it a lot..